Our kids are now teens and tweens (yes, we feel old). It seems like every time my wife and I turn around, they’re needing money for something. If you have kids then you know what I’m talking about. 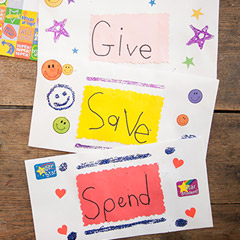 Teaching kids to save money is one of the most important jobs we have as parents. For advice on this subject, I consulted with the money guru himself…Dave Ramsey. Dave wrote the book Smart Money Smart Kids with his daughter, Rachel Cruze. I started reading it for one reason (teaching our kids about money) but got much more out of it. Many people these days think that “work” is a bad word. I learned early on that money didn’t grow on trees (Dang it!) If I wanted to buy something, then the only place I could get it was from work. Work helps to create discipline and structure in life. For the Debt Free Dr, I can’t imagine ever completely retiring. My personality wouldn’t tolerate it too well. Busy is my middle name. Whenever I’ve taken a week off from work, my routine and discipline starts to slack off which means it’s time to go back to work! Just ask Mrs. Debt Free. Too many parents allow their kids to sit in front of a computer, pad or X-Box all day. I’m not sure if they think a little work is going to kill them or not. There’s nothing wrong with getting kids to perform good old fashion work. Watering plants, mowing the yard or raking leaves creates a sense of accomplishment. Parents, it’s our job to not focus on so much of what our kids want, but more on what they NEED. If our kids graduate from high school only knowing how to be a gamer, complain and have a sense of entitlement, then we’ve set them up to FAIL. It’s on us to NOT let that happen. It’s essential to teach our kids how to budget and save at an early age. A study by the American Institute of CPAs in 2012 found that more than 60% of American parents gave their kids an allowance. Unfortunately, they also found that only 1% of kids save any of it. Giving kids an allowance is an area that Dave really helped opened my eyes to. Up until this point, we thought about giving our kids weekly allowances until I viewed it from his perspective. Dave doesn’t believe in giving kids an allowance because it doesn’t teach them how life really works. There’s an entire generation growing up thinking that money is free. Per Dave’s recommendation, the word “allowance” should NOT be in your child’s vocabulary. Instead, they should get to know and use the word “commission“. Explain to them that money comes from work. The younger they learn this, the better understanding they will have regarding the relationship between work and money. By doing this, you can avoid what all parents fear – becoming a Human ATM! 1. Use a jar or piggy bank to save. Once kids are put on a commission, they need a place to put it. Start with using a jar or piggy bank. Not sure how to talk about how this $$ can grow and benefit them? 2. Give them small chores. For smaller kids, try limiting the amount of chores they perform to three. Also, keep them short and sweet. We’re not operating a sweat shop! 3. Show them how to spend money. Remember, getting these younger kiddos to do a couple of chores and paying them is huge. One of the best ways to reward your little one for doing work is to go shopping with some of their earnings. That’s right. By doing this, you’re teaching them that stuff ain’t free. 4. Stress the importance of giving. Once kids start making money, they’ll understand that it only comes from working. But, you don’t want them to end up thinking they should get paid for every single chore they do around the house. We had that issue with our boys. A chore chart was implemented and each were responsible for five chores a week. When kids are 6-13, it’s time to upgrade their chores. The non-paid chores (chores they do because you put clothes on their back and a roof over their head) help teach kids how to be good citizens of their community or church which hopefully leads to them volunteering and giving in the future. 5. Teach the envelope system. The Save envelope, at this age, should be used as a long-term Spend envelope. The excess savings could be used for something like a toy or video game to purchase in the future. When I was 13 years old, I realized that if I wanted to buy something other than food or small items (which were provided by my parents), I had to work. As a 13 year old, I was already mowing our yard which led me to start a lawn service. Initially, I’d mow a yard then my dad would help with the edging and weed-eating until I became comfortable with the equipment. 6. Help them develop ways to make money. If you don’t want your teen to constantly hound you for money then do them and yourself a favor – help them find a job. You never know, they may realize that they don’t want to work for someone else which could help them become an entrepreneur. Fact: If you’re reading this and currently raising kids today then you’re at war – with contemporary culture. Unfortunately, this war is raging for the hearts of your children. Once you realize what you’re up against, then you can put together a battle plan of defense. In the US, we live in one of the MOST discontented cultures in history. Studies show, the more advertising you are exposed to, the more debt you are in. Read that line again until it sinks in. Which tells us that there is a correlation between the amount of TV you watch and the amount of debt you have. We are constantly being sold more and more stuff! As adults, we get this. But when it begins to affect our children, things can get really bad. Your child is assaulted with marketing from the time they learn to process information. Don’t believe me? Take a look at some of the advertisements on any of the kid’s channels. The toy industry is out to make their profits which can lead to a deadly disease of contentment for our kids. Here’s the deal. Companies know if they can plant the need or desire in a child’s mind early on, then they have employed the world’s best salesman to sell their product to Mom and Dad. Your kid!! For teens, it’s extremely important to teach them that if they think the next best thing is going to make them happy, then they’re going to be on the hedonic treadmill the rest of their lives. Why? Because there’s ALWAYS an upgrade! What can we do to win the discontentment war? If you want to raise kids that are smart with money, teaching them to be content with what they have is crucial. Contentment isn’t based on an amount or how nice your stuff is. It happens on the inside. I told my wife recently that it’s amazing how content I am now in life. I don’t have a “doctor” house or large office building, but I have all that I need. Health and family. What’s the point of wealth without health? At the first sign of discontentment, immediately address it with your child. Remember, the motive is to save the heart of your child. Remind your kids that owning stuff is fine and dandy, but when your stuff owns you, it’s not cool. Dave’s daughter, Rachel Cruze says, “More is caught than taught.” If you are part of the materialistic culture, then defeating the discontent enemy is going to be impossible. Your child is going to define what makes them happy based on the way you do. Ask your child their thoughts when they notice this type of behavior. You’ll be amazed at what your child can perceive no matter how young they are. Never forgo the opportunity to show your child how blessed they are no matter what they have or don’t have. I’ll never forget the look of astonishment on my kids’ faces a few years ago when we provided a family in need a Thanksgiving meal. Words can’t express something like that. They have to see it to believe it. Taking the time to teach your kids about money is going to take time and won’t be easy. Is anything in life easy? If you want your children to know how to manage money and be content with what they have, taking the time now will be well worth it. Really wonderful post DFD. This is something that I really have to be on top of for my daughter who has been getting an allowance for just taking care of her own mess and cleaning up after her pet. Hi Xrayvsn: Yes, it’s amazing how many kids these days don’t have parents that encourage them to work. This is a HUGE downfall that will affect them later on in life. Good advice. We used 3 jars. Giving, short term savings (used for small things in the near future), and long term savings (put into the bank for distant things like cars, houses). We put 10% in giving, 20% in each of the other 2 and the last 50% went into their pocket to do as they liked. They often added from their pocket to the jars as well. They became savers and givers.